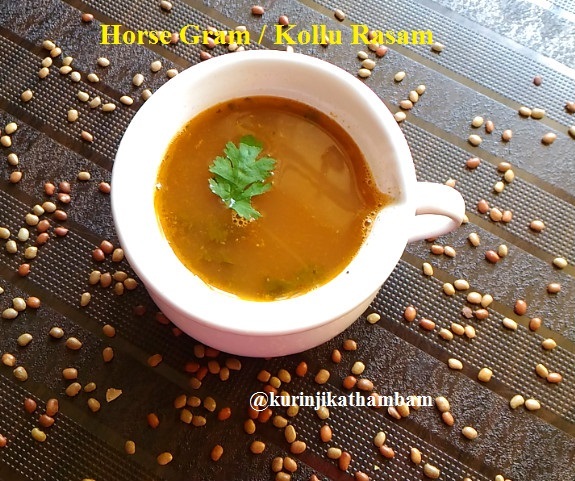 For General Fever and Cold/Cough, Horse Gram Rasam is a good remedy. It is actually a Soup which can be drunk separately just like normal soups. I recommend having this atleast once in a week as it is very good for health. 1. Wash and soak the tamarind in hot water for 2 mins. Then extract the juice from the tamarind using little water. 2. Wash and chop the coriander leaves into small pieces. 3. Cook the horse gram and drain the water from the dal. 4. Wash and chop the tomato into small pieces. 5. Just crush the garlic pods and keep it aside. No need to remove the skin of the garlic pods. 6. 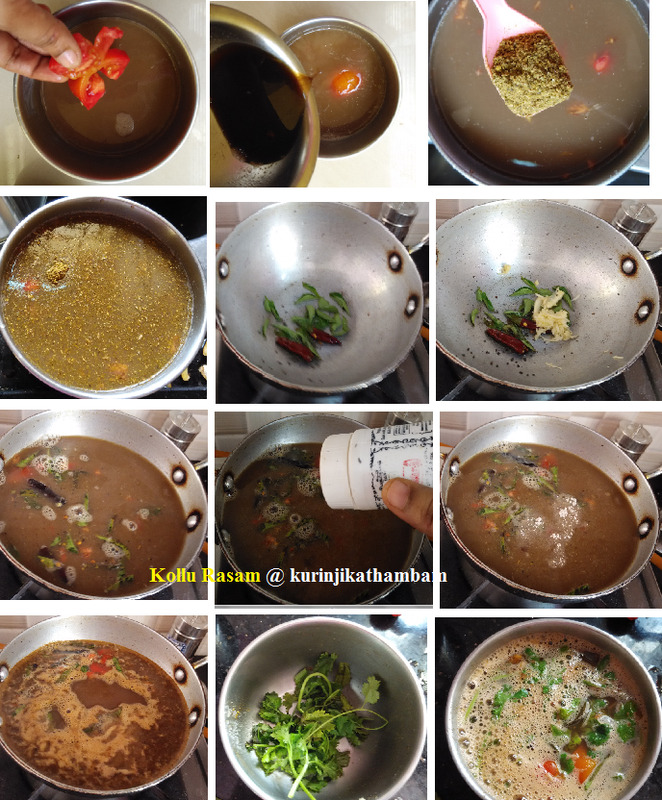 Mix the tamarind puree (from 1), horse gram water, tomato, rasam powder and salt. Add water (1 cup) and mix them well with your hand. Adjust the water level according to your taste. 7. Heat the oil in a pan, add mustard seeds and wait for popping. Then add the curry leaves, red chilly (split into two halves), crushed garlic pods (from 5). Sauté till the garlic pods becomes brown color. 8. Then add the horse gram rasam mixture (from 6) and hing. Keep the flame at simmer. Cook till the rasam become frothy. Switch off the flame when it starts to boil. 9. Put the coriander leaves in the serving bowl, now transfer the rasam into the serving bowl. Immediately close the lid of the bowl. Leave it for 2 mins and then serve. Healthy and really yummy rasam is ready. 1. You can add more horse gram water and reduce the normal water level. 2. Adjust the red chilly level according to your taste. ( cumin seeds-1/2 tsp, pepper-5, channa dal-1 tsp, coriander seeds – 1 tsp and curry leaves 1 spring ) into a coarse powder and use this instead of rasam powder. 1. How to cook horse gram?